The ASUS PEB-10G/57840-2T is designed to take advantage of high-performance 10Gb/s connectivity technology to meet the need for faster rates of data transmission. It is one of the latest 10 Gigabit Ethernet innovations and is a cost-effective 10 Gigabit Ethernet solution for the broader server market. Through the PEB-10G/57840-2T Ethernet adapter, users are able to simplify migration to 10GbE and to enjoy the cost-effective RJ-45 connectivity with the support of a much longer cabling distance. 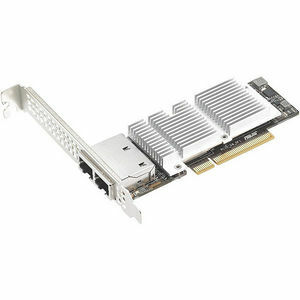 The ASUS PEB-10G/57840-2T adapter features PCI-E 3.0 interface and a smaller 4.72"x 1.77" form factor. The 4.72"x 1.77" form factor is even smaller than standard low-profile MD2 form factor; thus allowing customers to integrate the adapter in space-limited systems easily and flexibly. PEB-10G/57840-2T provides a flexible and perfect fit for various server integrations. The ASUS PEB-10G/57840-2T Ethernet adapter provides a cost-effective 10GBase-T solution that enables 10 Gigabit Ethernet operations over twisted-pair copper cabling, which can reach up to 100 meters, offers great flexibility for network design. With the cost-effective RJ-45 connectivity, PEB-10G/57840-2T provides a more affordable 10 Gigabit Ethernet performance. It also provides the backward compatibility which allows most users to simplify migration to 10 Gigabit Ethernet.